These low carb pumpkin spice cupcakes are the softest and crumbliest cupcakes you’ll ever have. Made egg free, sugar free and gluten free, they’re also topped with some decadent sugar free cream cheese frosting. They can also easily be made dairy free. I’m warning you, you may not be able to stop eating them once you start! We’re finally in fall season which means I’ll be uploading lots of pumpkin-themed goodies this month and the next. I hope you’ve tried my low carb pumpkin cheesecake as it’s one of my favourite on the blog or the dairy free pumpkin whoopie pies from last year. I spent the whole weekend making new pumpkin-themed recipes, including a pumpkin bundt cake and healthy pumpkin cake bars. I can’t wait to share them with you, but in the meantime here’s my latest recipe for keto pumpkin cupcakes! 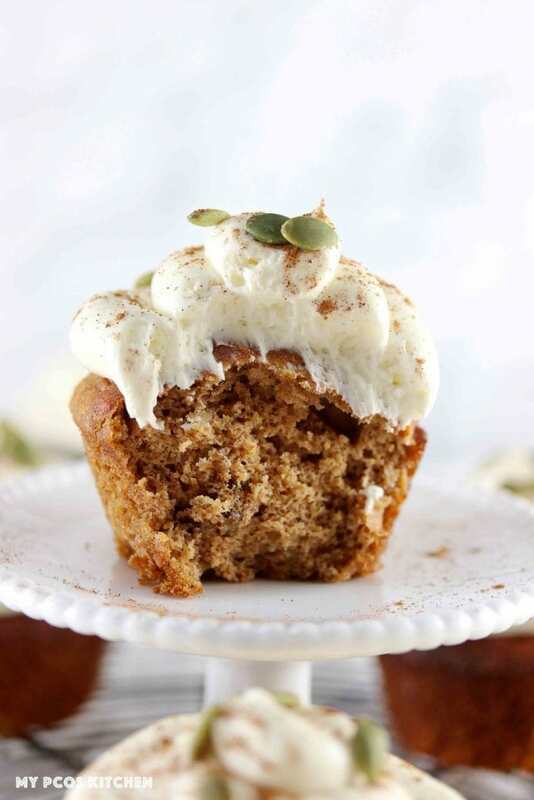 This pumpkin spice cupcakes recipe is pretty different than my low carb pumpkin muffins. The muffins are more spongy and eggy, whereas these low carb cupcakes are more soft, crumbly and moist. These pumpkin cupcakes are covered in a delicious sugar free cream cheese frosting recipe that I uploaded previously. A combination of cream cheese and heavy cream makes the creamiest frosting! The low carb cream cheese frosting is sweetened with powdered erythritol and stevia powder to give it the smoothest and sweetest taste. I highly recommend using powdered erythritol in this frosting recipe as using the granulated kind won’t make it as smooth and it will be pretty grainy. If you don’t have powdered erythritol, you can easily make some by pulverizing some granulated erythritol in a blender for about 30 seconds. You can also skip the sugar free cream cheese frosting altogether and have yourself some healthy pumpkin muffins instead! The cream cheese frosting is entirely optional, but it obviously goes really well with the pumpkin cupcakes. If you’re looking for a dairy free option, you can always use my dairy free whipped cream recipe or the dairy free icing from my pumpkin bundt cake which I will be uploading in a couple of days. These healthy pumpkin cupcakes don’t require that many ingredients, but I did do lots of recipe testing to see if you could substitute some ingredients for others. 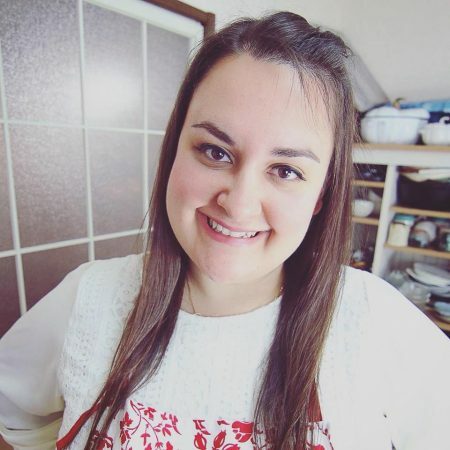 Scroll down below to see some of my tips and possible substitutions! These gluten free pumpkin cupcakes do not require that many steps, thankfully. 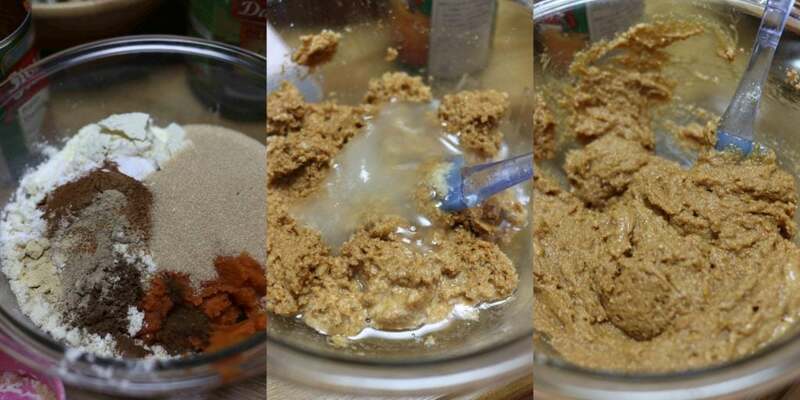 Simply add the dry ingredients together and mix. To the same bowl, you’ll need to add all of the wet ingredients and mix together. The next step is to either oil some non-stick muffin pans or use muffin cups. I decided to oil my muffin pans and then poured the batter into 6 holes to make 6 cupcakes. Note that you can totally double this recipe and make 12 pumpkin cupcakes, but that would mean that I’d have to eat 12, which is not an option for me! Once the muffin pans are oiled, just spoon in the batter equally and bake for 20 minutes. All of our ovens are different, so you may need to adjust the cooking time. To check if they’re ready, dip a toothpick in the middle of a cupcake and see if it comes out clean or not. If not, bake them for an extra couple of minutes. This next step is really important. Cupcakes or muffins made with whey protein tend to solidify as time passes, so it’s best that you take off the cupcakes out of the pans while they’re still hot. The first time I made these, I waited until the muffins had cooled down before taking them off the muffin pan, and half of them stuck to the pan or broke apart. So it’s extremely important that you take the cupcakes out of the muffin pan while they are still hot, maybe 2 or 3 minutes after taking them out of the oven. Or just use muffin cups and you won’t have to worry about this step. Once your cupcakes are cooled, you can then decorate them with the cream cheese icing. I used a round tip and waited until my sugar free cream cheese frosting was at room temperature before decorating them. 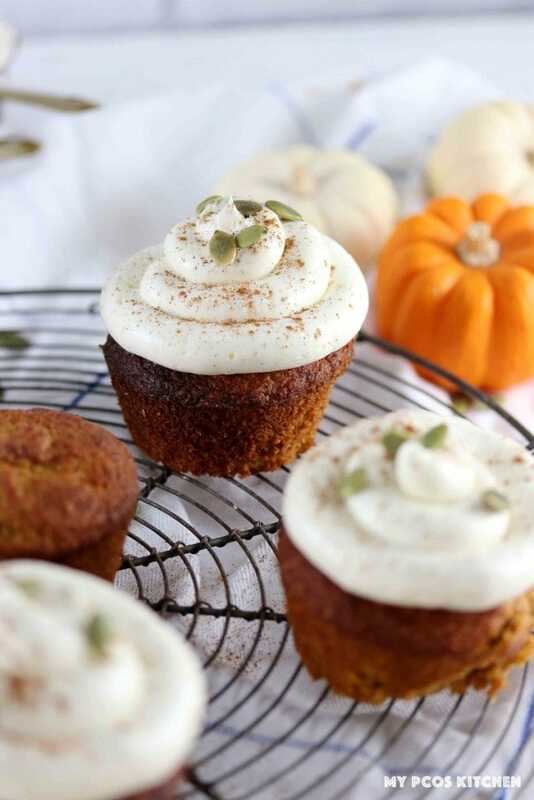 What sweeteners should you use in this pumpkin spice cupcakes recipe? 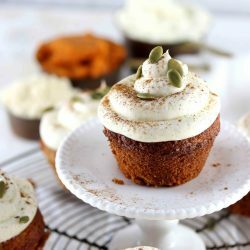 I’ve tested this pumpkin cupcakes recipe with golden sweeteners from Lakanto and Sukrin, and a combination of erythritol and stevia powder or monk fruit powder. I love using golden sweeteners when baking as it’s just like using brown sugar. For your information, Lakanto is a mix of erythritol with monk fruit powder and Sukrin is a mix of erythritol with stevia powder. I also always get asked if you can use Swerve instead of erythritol. Swerve is simply erythritol with a brand name so yes, you can use it as it’s the exact same item. I wanted to see if I could recreate the sweetness and consistency of golden sweeteners with erythritol and stevia or monk fruit powder. Since I added 1/2 cup of golden sweetener to my original version, I figured adding 1/2 cup of erythritol would be the perfect sweeteness, but it ended up way too sweet. I suggest using 6 tablespoons of erythritol with a 1/4 teaspoon of either stevia powder or monk fruit powder to achieve the same results as 8 tablespoons of golden sweeteners. You can actually swap the pumpkin puree for many different kinds of starches. For low carb substitions, you can use mashed kabocha squash, grated carrots, or grated zucchini. For higher carb substitutions, you can use mashed sweet potatoes, mashed bananas, or unsweetened applesauce. I’ve tested these low carb pumpkin cupcakes with three different proteins to see if they would work. Whey protein isolate was my favourite protein to use and made these easy pumpkin cupcakes super crumbly and soft. The almond flour made them a bit denser and not as crumbly. Finally, the egg white powder made them quite hard and not soft or crumbly at all. I’m sure there are other protein powders or flours you can experiment with, but for now these are the three that I’ve tried baking with. Since whey protein isolate is a protein just like gluten, it helps make these low carb pumpkin cupcakes rise and make them fluffy. This was my favourite protein to use as the cupcakes ended up just like I wanted. I recommend using this if you can consume dairy. Whey protein isolate is a great ”flour” to bake with or deep fry with as it gives the baked goods more fluff and moisture. 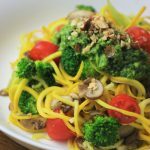 From keto fried chicken, to healthy pumpkin bars, to my friend Carolyn’s Kentucky Butter Cake, whey protein can be used in many kinds of ways without affecting the carb content that much. Make sure to use whey protein isolate as that contains no carbs. Other types of whey protein tend to add fillers and additives so the carb count can be quite high. I recommend using the whey protein isolate from NOW as I’ve never had any problems with it. 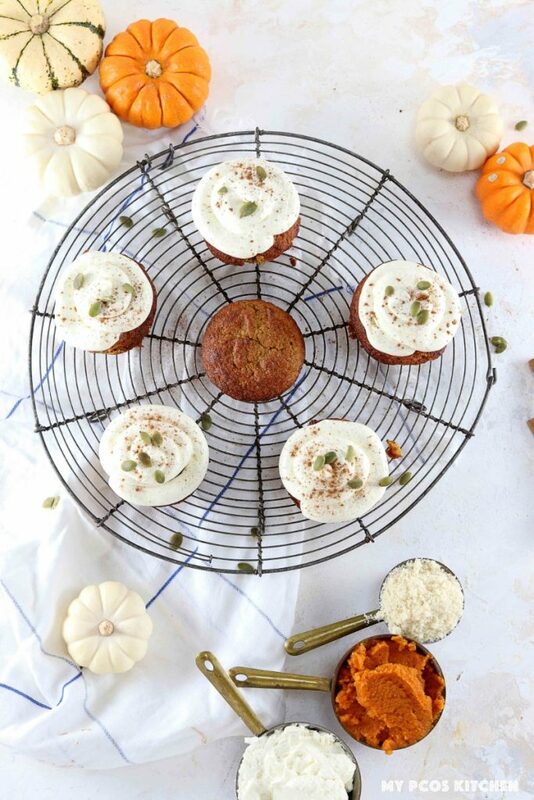 If you need to make this pumpkin cupcakes recipe dairy-free, then almond flour is your go to! I’ve made this recipe with almond flour and the pumpkin spice cupcakes end up a little similar, but the ones with the almond flour were definitely denser and not as crumbly. Almond meal or blanched almond flour both work. Substitute the 1/2 cup of whey protein powder for 1/2 cup of almond flour and add 1 egg. Egg white powder is grounded up egg whites with nothing else added. It works similarly to the whey protein, but makes the pumpkin spice cupcakes much dryer and not as crumbly. 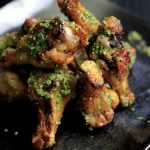 It’s actually my favourite protein to use, like in my paleo fried chicken, when it comes to breading meat or fish and deep-frying them. It is however a dairy free option and not an egg free option if you need it. I don’t highly recommend it as the end product was just not as good as with the whey protein or with the almond flour. Make sure to get some egg white powder and not meringue powder as those are two completely different things. Meringue powder is filled with sugar so be careful! I recommend the NOW brand of egg white powder. Substitute the 1/2 cup of whey protein powder for 1/2 cup of egg white powder. Instead of coconut oil, you can use butter, ghee, avocado oil, lard, shortening or beef tallow. Instead of almond flour, you can use any other kind of nut flour or sunflower seed flour. Instead of apple cider vinegar, you can use white vinegar or lemon juice. Instead of Lakanto golden, you can use Sukrin gold, or 6 tbsp of erythritol and 1/4 tsp of stevia powder or monk fruit powder. Make sure to let the cupcakes completely cool down before frosting them, or you’ll have a melted mess! These keto pumpkin cupcakes can be frozen! Just thaw them in the fridge, or on the counter for a few hours. If you’re in a hurry, you can also microwave them for about 40-50 seconds, and you’ll have a delicious treat! Make sure to use unsweetened pumpkin puree and not pumpkin pie filling as that contains sugar! Make sure to use refined coconut oil, or else you’ll get a huge coconut taste with the extra-virgin kind! 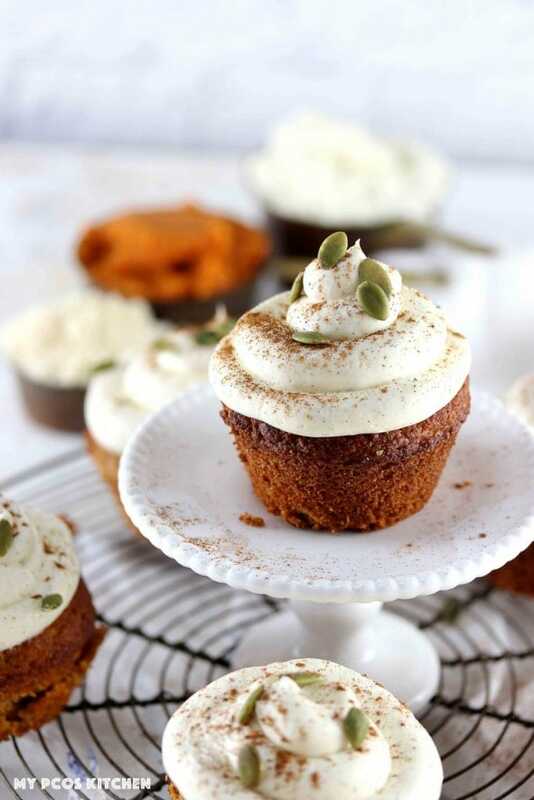 Moist and crumbly pumpkin cupcakes that are gluten free, sugar free and egg free! Add the wet ingredients to the dry ones and mix well together until a smooth pumpkin paste forms. Oil a regular muffin sized pan (just six muffins though) or line 6 muffin holes with 6 muffin cups. 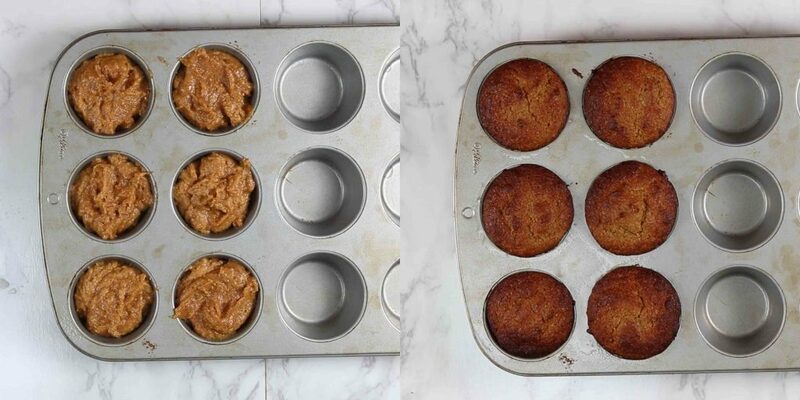 Spoon the pumpkin batter evenly into 6 muffin holes to make 6 cupcakes. Place the muffin pan into the preheated oven and bake for 20 minutes. Once baked, take out and let cool for a couple of minutes. If you've oiled the muffin pan instead of using muffin cups, take the muffins out of the muffin pan as soon as you can, like 2-3 minutes after you've taken them out of the oven. The reason is, the top of the cupcake tends to harden and it gets harder to take out after. After that, just let them cool completely before decorating with frosting. Whip the cream cheese until soft, for about a minute. Add the erythritol and stevia and whip together again. Add the heavy cream, a little at a time, until it's all incorporated. 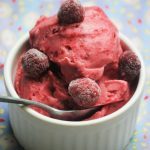 Whip it with a hand mixer for 2-3 minutes. Add the vanilla and mix together. Frost the cupcakes the way you want. You can either add dollops of frosting over each cupcake, or you can fill a piping bag with any tip you like and pipe the cream over the cupcakes. For the ones in this recipe, I used a large round tip. Note 1: You can use 1/2 cup of Lakanto Golden, or 1/2 cup of Sukrin Gold. Or, 6 tbsp of erythritol + 1/4 tsp of stevia powder, or 6 tbsp of erythritol + 1/4 tsp of monkfruit powder. 2: You can sub the whey protein for 1/2 cup of almond flour + 1 egg. 3: Keep these keto cupcakes refrigerated at all times, even without the frosting, for optimum freshness.